The Package Call object as it appears in the Toolbox. The PackageCall object permits a block of E-Basic script to be loaded into the Experiment Specification file from a text file. The PackageCall object is most useful when a segment of script is used by multiple experiments. The use of package files reduces the copying, pasting, and maintenance of inserting script that is reused often. PackageCall objects refer to package files (*.epk3) containing E-Basic script that adheres to a required format. 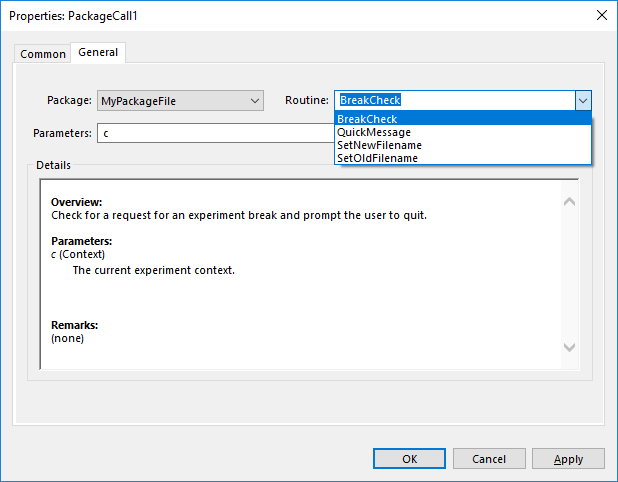 Package files define one or more code routines that may be accessed through a PackageCall object once the appropriate package file is installed in the program. 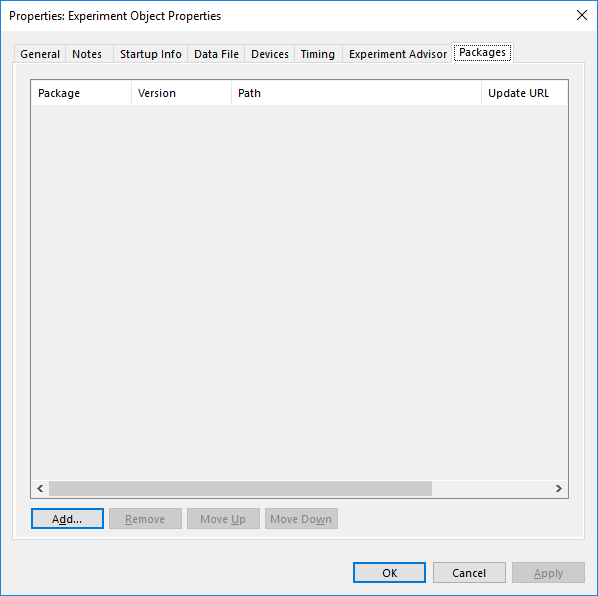 To use a Package file in an experiment, it must be added to the experiment via the Packages tab in the Experiment object Property pages. Double-click the Experiment object in the Structure view to display the Property pages, and select the Packages tab. Each package file must exist in a unique subdirectory within the Packages folder portion of the E- Prime installation (default location is C:\Program Files\PST\E-Prime 3.0\Program\Packages). When the Add... button is clicked, The Add Package dialog will be displayed, showing all available packages. 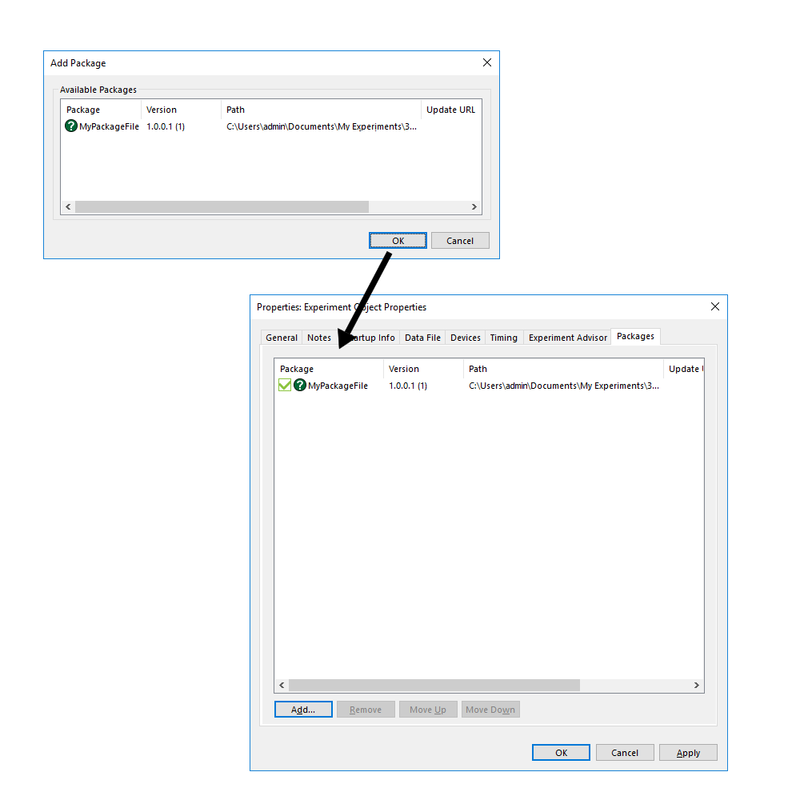 Select the appropriate file in the Available Packages column and click OK. Once added, the package file’s icon will be displayed on the Packages tab with the Experiment object’s Property Pages. The checkbox next to the package file’s icon allows a specific package file to be enabled or disabled without uninstalling or reinstalling. When a package file is disabled, no script will be inserted from the file during the compile process. 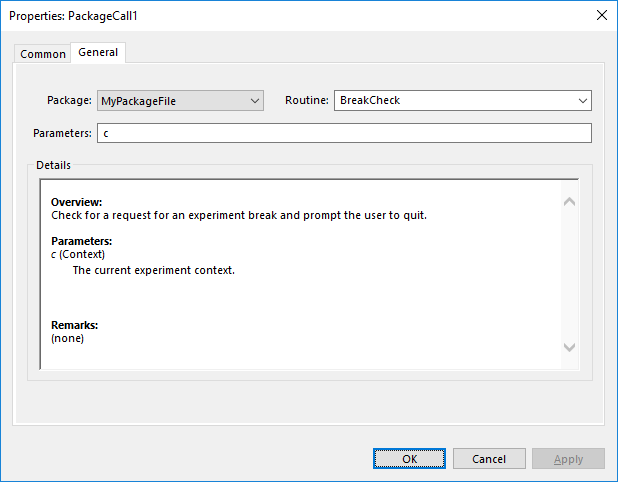 After the appropriate package file is added in the Experiment object, the code routines contained within the package file may be accessed using a PackageCall object in E-Studio. The PackageCall object is equivalent to inserting a segment of user-written script into a Procedure via an InLine object. The placement of the PackageCall in the experiment’s Procedures determines where the script called by the PackageCall is inserted in the complete experiment script when generated. Dragging the PackageCall object icon to the Workspace, or double-clicking a PackageCall object in the Structure view will open the object’s Property pages for editing. 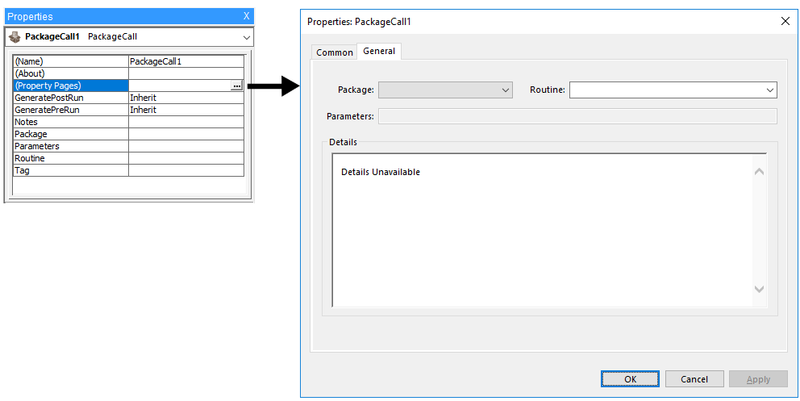 The properties for the PackageCall object may be set using the Property pages. The Property pages may be displayed by double-clicking the PackageCall object in the Structure view, or by clicking the ellipses (…) in the Property Pages field in the Properties window. Refer to E-STUDIO: Common Object Properties  for a description of common properties associated with all objects. The General tab permits the identification of the Package file and routine to be called, as well as the parameters required by that routine. Package Installed .epk3 files, selected from dropdown Name of the Package file to be called. Routine Suboutines defined in the package file, selected from dropdown Name of the routine to be called. Parameters Package-dependent Parameters passed to the routine. Details Read-Only User defined string that is useful for associating information with an object. (Name) String values Assigns a user-entered string as the name of the object. (About) -------- Displays the About Label dialog (currently not implemented). (Property Pages) -------- Displays the Property pages for the object. GeneratePretRun Inherit, TopOfProcedure, BeforeObjectRun Where the prerun part of this object is generated in the script. Tag String values, Attribute references. User-defined string that is useful for associating information with an object.